Douglas Crouthers, Director of International Sales for ICTV Brands, stated, “We are honored to have DermaWand selected for rollout with LMS. This is a very exclusive opportunity, as LMS only markets 15 to 17 products at any given time on their networks. ICTV Brands, Inc. (ICTV), (CSE :ITV), a direct response marketing and branding company focused on the health, wellness and beauty sector, announced today that its DermaWand Show has been declared for rollout by Latino Media Services (LMS) across 16 Spanish speaking Central and South American countries including Colombia, Venezuela, Chile, Peru, Uruguay, Ecuador, and Argentina. The LMS network expands the market opportunity and availability of DermaWand to an additional 150 million people, reaching over 360 million people from Mexico to the southern tip of South America. Latino Media Services is the leading agency whose media services bring together many of the top DRTV distributors in Latin America with the worlds strongest suppliers of direct response products. LMS works with over 20 of the largest pan-regional cable and satellite networks in Latin America. LMS’ approach with the networks is one of building long-term partnerships, thus bringing together much of the most important direct response media in the region with the most important buyers of that media. For more information about LMS please visit http://www.latinomediaservices.com. LMS uses a unique process where marketers in each country vote for the products they choose to distribute. 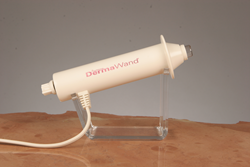 DermaWand had to perform as a AAA product during the test in order to be considered for roll out. Year-to-date through September 30, 2014, ICTV Brands has sold over $4.7 million through its network of international distributors, which exceeds all of 2013 sales through the same channel. The partnership with LMS will only go further to support our record international sales for 2014. Latino Media Services is the leading agency whose media services bring together many of the top DRTV distributors in Latin America with the worlds strongest suppliers of direct response products. LMS is considered a major DRTV advertiser by 31 of the strongest pan-regional cable networks serving Latin America. LMS is committed to a long-term partnership approach with each network. ICTV Brands, Inc. sells various health, wellness and beauty products through a multi-channel distribution strategy. ICTV utilizes a distinctive marketing strategy and multi-channel distribution model to develop, market and sell products through direct response television (DRTV), Internet/digital, e-commerce, live television shopping and retail. Its products are primarily sold in the U.S. and available in over 35 countries. Its product include DermaWand, a skin care device that reduces the appearance of fine lines and wrinkles, and helps improves skin tone and texture; DermaVitál, a professional quality skin care range that effects superior hydration; CoralActives, a line of acne treatment and skin cleansing products. ICTV Brands, Inc. was founded in 1993 and headquartered in Wayne, Pennsylvania.